FRI KarRC RAS. Vetchinnikova Lidya V.
Keywords: Betula sp., B.pendula Roth vss.carelica Merckl., curly birch, B.dalecarlica Lf., intra- and interspecific variation, intra- and interspecific hybridization, heritability, grafting, cell, tissue and organ culture, biochemical systematics, lipids, fatty acids. 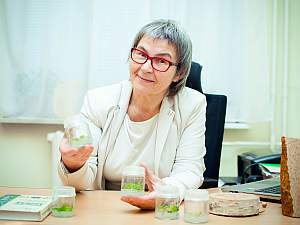 Scientific publications: Lydia Vetchinnikova (Konina), has 72 publications (1 monograph), 5 patents. Lydia Vetchinnikova (Konina), has been studying the intra- and interspecific variation on birch under northern conditions since 1974. She has devoted much of the time (1974-1982,1994-1999) to woody plant physiology and fatty acid composition of lipids and the dynamics of their accumulation in birch species in the North. In 1980-1991 she studied anatomical aspects of bark of woody plants (Birch, Tilia, Alnus and etc.). In 1991 established the basis for laboratory experiments on the micropropagation of woody plants. Now she is the leader of the projects devoted to the study of the physiological features of adaptation of different birch species in the North and micropropagation of rare forms (curly birch, crispa, ice birch). She also cooperates with the Museum of Regional Studies (public awareness aspect) and The State Commitee on Forestry (governmental decision-making institution). Lydia Vetchinnikova (Konina) is a member of the Societies of physiologists, botanists and geneticists. Occasionally gives lectures to students at the Petrozavodsk University, and supervise-students preparing their dissertations.